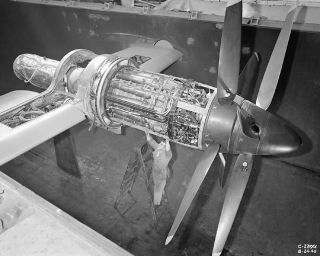 A mechanic checks the large turboprop engine prior to testing in the Altitude Wind Tunnel. In this historical photo from the U.S. space agency, an engine mechanic checks instrumentation prior to an investigation of engine operating characteristics and thrust control of a large turboprop engine with counter-rotating propellers under high-altitude flight conditions in the 20-foot-diameter test section of the Altitude Wind Tunnel on Aug. 25, 1949. The Altitude Wind Tunnel was located at the Lewis Flight Propulsion Laboratory of the National Advisory Committee for Aeronautics, Cleveland, Ohio, now known as the John H. Glenn Research Center at Lewis Field.